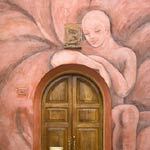 Hunchbacks are present in many local legends and fairy tales across Italy, especially in the North. 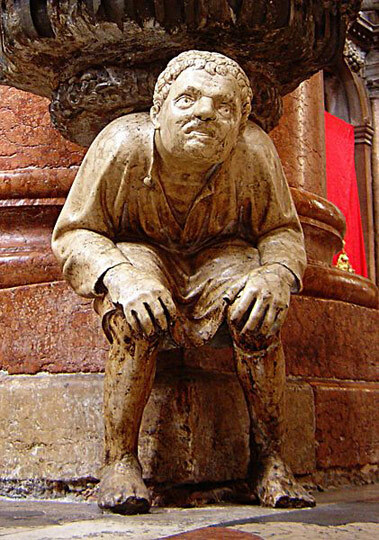 Except for a few cases, hunchbacks are usually not represented as malicious or vicious creatures, but as good souls who personify humility and hardship, reason why they are often thought to bring luck. 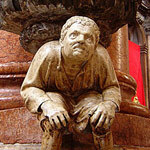 In this article, we are, more specifically, going to focus on hunchbacks legends linked to monuments in Italy. 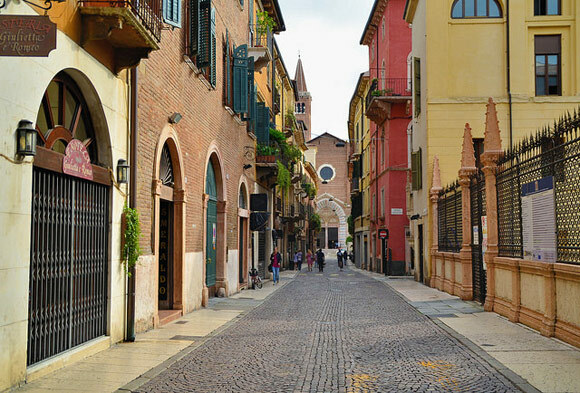 Verona, with the Sant’Anastasia Church in the background. Photo: Jpellgen. The hunchbacks of Verona are two figures in the Sant’Anastasia church of Verona, which are supporting the two stoups at the base of the first columns of the church’s central nave. 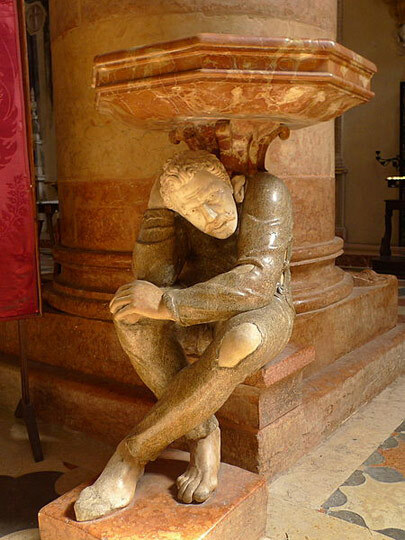 Hunchback of Verona by Paolo Caliari. Photo by David Monniaux. The one on the left is the work of Gabriele Caliari, eldest son of Paolo Caliari, better known as the Veronese. The one on the right is attributed to Paolo Orifice. Both statues symbolize the humility and poverty of the Veronese population and it is said that touching their hump brings luck. 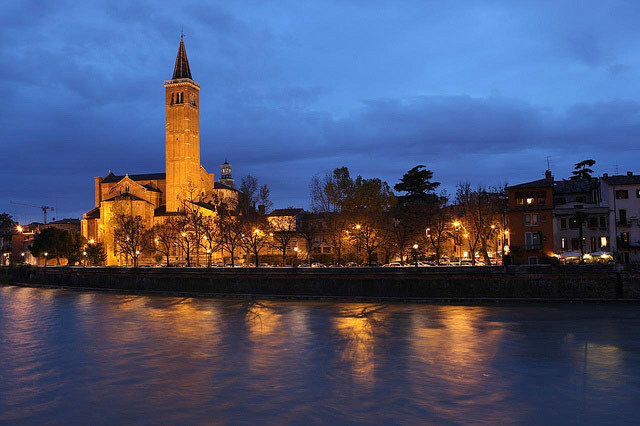 Sant’Anastasia Church, Verona. Photo by Holly Hayes. Gobbo di Rialto. Photo by David Bramhall. 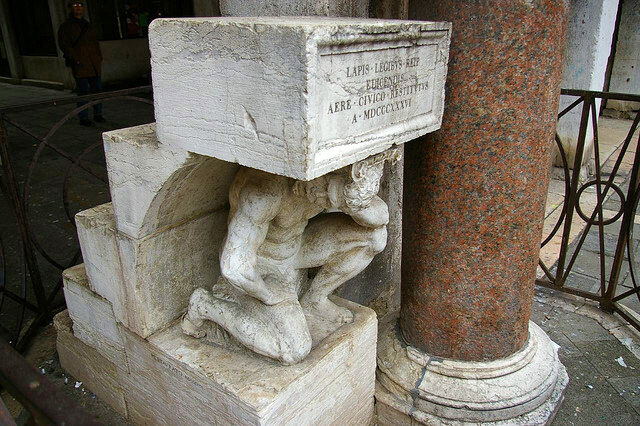 The Hunchback of the Rialto or Gobbo di Rialto is a marble statue found at the end of the Rialto opposite the Church of San Giacomo di Rialto in Venice. The Rialto was the financial and commercial center of the city. The statue, sculpted by Pietro da Salò in the 16th century, depicts a crouching, naked hunchback supporting a small flight of steps. It was used as a podium for public proclamations, sentences and decrees by the Republic of Venice. Actually, the Hunchback is not really a hunchback, but a man curved and suffering under the effort of supporting the staircase. The weight he is supporting symbolizes the burden of the sentences that were proclaimed from the podium. 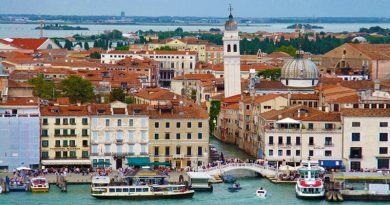 It was also here that thieves, who had been stripped naked and made to run the gauntlet of citizens lining the streets from Piazza San Marco to the Rialto, could save themselves from further humiliation and punishment by kissing the Hunchback. At the same time the statue was used to spread satirical notes and political pamphlets, in much the same way as happened with Pasquino, one of the Talking Statues of Rome, and Florence’s famous “piglet” in the Loggia del Mercato Nuovo. The Talking Statues of Rome could also establish a dialogue with each other, exchanging a correspondence of pamphlets, and so did the Roman Pasquino with Il Gobbo, when conversing about the Republic of Venice, the Pope and the Cardinals. The Italian historian and satirist Gregorio Leti highlights the existence of this correspondence between Pasquino and the Gobbo in his 1671 Political Visions Le visioni politiche sopra gli interessi più reconditi, di tutti prencipi, e republiche della Christianità: divise in varij sogni, e ragionamenti tra Pasquino, e il Gobbo di Rialto, il tutto dato alla luce per la commodità de’ curiosi. According to some sources the characters of Launcelot Gobbo and his father, Old Gobbo, in William Shakespeare’s The Merchant of Venice may been inspired by this traditional symbol of the Rialto. However, it should be noted that the surname Gobbo is common in the Veneto region, from where it originated. Ponte Gobbo, Bobbio. Photo by Matteo Russo. In the Middle Ages, the construction of a bridge was a work of great engineering skill, considered almost miraculous. For this reason, the construction of bridges has given rise to many legends, which often had the devil as protagonist, since joining two places that the nature (and God) had intended to be separated was viewed by many as a “work of the devil”. 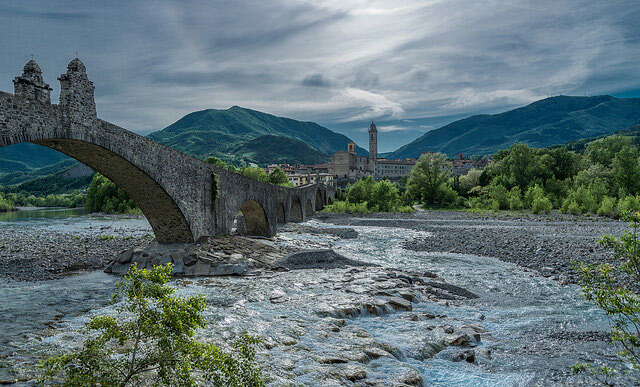 In one of the legends concerning the Hunchback bridge (Ponte Gobbo) of Bobbio, the devil bought the soul of an innkeeper who resided on the other side of the Trebbia river. The innkeeper wanted to see his trattoria connected to the rest of the town, including to the deviation of the main shopping street going toward Genoa and Chiavari (the present road was built only recently), which would bring a substantial increase in revenue, so when he saw an old hunchback with a stick asking him if he was willing to sell his soul in exchange for the bridge, the innkeeper did not recognize the devil, he just laughed, but then nodded with his head and shook hands with the old man, who began laughing loudly in front of the unsuspecting innkeeper. 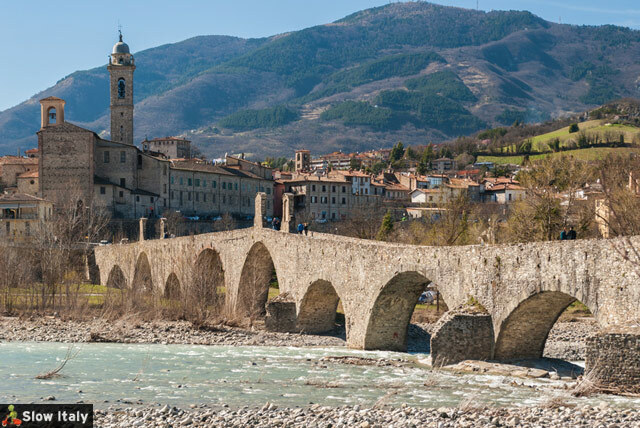 Ponte Gobbo with the town of Bobbio in the background. 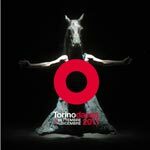 Photo © Roberto Lo Savio/fotolia. The devil sent little devils of different statures who each built a piece of the bridge, which, according to the legend, explains why the arches of the bridge are of various dimensions. To everyone’s surprise, the bridge was finished overnight, but soon appeared to be bewitched. Indeed, the devil had claimed the soul of the first creature who would cross the bridge. Thinking he could trick the devil the innkeeper sent his dog over the bridge. The devil took the dog’s soul, but obviously was infuriated for having been hoodwinked. Ultimately the devil was overthrown, but before disappearing he left his marks on the bridge, giving the bridge its current “hunchbacked” appearance. According to the art historian Carla Glori the three-arched bridge that appears over the left shoulder of the Mona Lisa is the Ponte Gobbo. Her theory is based on the fact that the numbers 7 and 2 are concealed in the span of the bridge, which is supposedly a reference to the year 1472, the year in which the bridge was destroyed by a devastating flood. Photo credits (top to bottom): Verona with the Sant’Anastasia Church in the background by Jpellgen; Hunchback by David Monniaux; Hunchback Verona by Hans Weingartz; Sant’Anastasia blue hour by Holly Hayes; Gobbo di Rialto by David Bramhall; Ponte Gobbo by Matteo Russo; Bobbio with the Ponte Gobbo © Roberto Lo Savio/fotolia.